Rope clouds are often associated with tornado. You may already have seen them on television, the internet or up close. But have you ever wondered how it came about and what it says about the tornado? 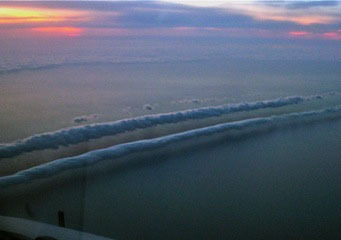 Learn more about this cloud phenomenon on the succeeding paragraphs. Rope clouds refer to narrow funnel-shaped clouds marking the dissipating stage of a tornado. Because they occur at the final phase of a tornado’s life, many people think that they are weak and do not bring much damage. On the contrary, these clouds are capable of bringing so much destruction. These clouds form as a result of weakening winds in the condensation funnel when the circulation is completely wrapped by an outflow of air either from the thunderstorm or other sources. At What Height is Rope Clouds Found? Rope clouds are created at about 6,500 feet above the Earth’s surface and are usually associated with severe thunderstorm when the weather is disturbed. When you observe rope clouds in the sky, don’t take chances. Take cover immediately as it may still produce extensive damage. How do Rope Clouds Form? Rope clouds form due to the weakening of winds within the condensation funnel of a tornado. It occurs when the tornadic circulation is wrapped by cold air from the thunderstorm or other sources. Warm air powers the tornado. When warm air rises through the core of the tornado all the way to the thunderstorm cell, cold air descends and moves toward the outflow of thunder cell. The sinking cold air gradually wraps around the tornadic circulation, preventing the warm air to get into the updraft that feed the tornado. Hence, tornadic circulation starts to weaken forming rope clouds. These clouds mark the final stage of a tornado’s life before it breaks up completely. What do Rope Clouds Look Like? As the name suggests, rope clouds appear like skinny and elongated ropes often in snake-like form. It is similar to a hanging string when viewed from a distance prior to breaking up completely. Even so, they remain dangerous as they are capable of producing significant damage most especially if it the deteriorating tornado is a violent one. How common is a Rope Cloud? Rope cloud is commonly seen over tornado-prone areas. Although tornadoes happen in many parts of the globe, the stronger ones frequently occur in the United States during summer and spring months. In fact, the U.S. has the highest incidence of tornadoes due to their unique geography that breeds strong and long-standing thunderstorms. The Central Plains in America which include Kansas, Nebraska, Oklahoma and Texas are the places where tornadoes often develop, thus, they are collectively called the tornado alley. Even if rope clouds indicate the final stage of tornado, it can still be dangerous requiring you to take cover immediately.